It was an enjoyable 2 days for me! Got to hang around with my mates from KL Office and enjoyed every minute of it. I also had my own driver! How cool is that?? Hehe..Thank you Mamat for being such a nice driver. 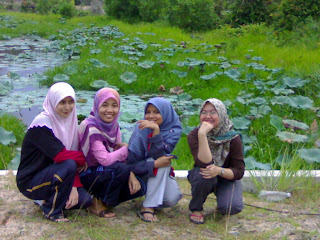 We (Kerteh Office staffs) pushed off from Kerteh at about 8am. Initially, I freaked out when I heard about the departure time. It only takes 3 hours (maybe ++) to reach Summerset but why such early hour? But the head of the convoy team, Yufi, explained that we might need to wait for people from Kuantan and other place, have breakfast, bla..bla.. No room for arguement. Rendered me speechless. In order to get up early in the morning (coz I don't get up earlier than 8am when it's my day off...but Subuh prayer is still befor 7am k), I need to sleep early, earlier than 12 am. That was my plan. Well, it didn't work, coz on Friday, me and my housemate, Fida, went to Kuantan to catch the "Jangan Pandang Belakang" movie. It was kinda spontaneous plan. SInce the movie has been in the cinema for quite sometime, it has less showing time. We reached the cinema at about 330pm and we had already missed the 220pm show. That left us with the 915pm and 1115 pm show. Fida was kinda worried since I would be driving in the next morning but hey, I was there with sole purpose to watch that show and I'm not going back empty-handed. Yeah, we would be late when we got home, but it is one-and-a-half-hour drive from Kerteh to Kuantan. And so, we watched it at 915pm. It is a horror movie, I think you have read in the paper, and yes, the movie did make me scream. However, I still managed to sleep that nite, with my lights off. My best friends from KL Office, Noraini and Mariam, were elated to see me. For the 2 days, I joined them with 2 other mates, Liza and Kim. We were always in a group and we made our stay here in Summerset as interesting as we could. Since the only get-together is during our meal time and the grandest is during our BBQ dinner, the rest of the time is free and easy. It means, it's up to you to do anything you want. So, after checking in and relaxing for few hours, at 4pm, me and my group cycled around the Summerset. We rented it for an hour. 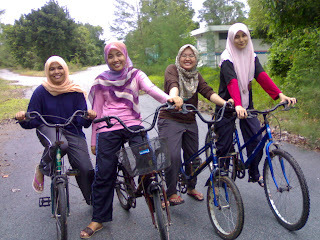 But it was worth every penny coz we got to explore Summerset and also, we went jungle trekking on bikes. It was so much fun than walking. We decided to enter the eco trail (the name of track) for the second time but quickly dissolved the idea after few "ulat bulu" parking dengan hebatnyer kat my pants. Mariam, the bravest of us all, remove the "ulat bulu" using the fallen leaves. Thanks, Mariam! For the dinner, I put on my favourite pants and blue-blouse with blue-scarf. Actually, it wasn't my planned attire. It was supposed to be a long flowing white-skirt with green blouse that I just got for myself. It even has matching sandals but I decided against it. I heard the dinner to be held near the beach and I don't think it's appropriate to wear a skirt, with the strong winds. However, due to the unpredictable weather, the dinner was held at the grand hall. Such a waste! With the rest of the gang! The dinner was OK la. The food is OK (I heard some people are complaining but not me) and the performance not so bad. The hi-lite of the event was surely the much-anticipated lucky draws. Unfortunately, this year, the company only allocated 70 gifts, unlike the year before where everyone was "lucky". Eventhough the items doesnt cost much (few of my friends got items that cost than RM20 last year), but the joy of having your numbers called was indescribable. This year, I was one of the lucky 70, I got myself a mixer (I dunno what is it for). The next day, I had to get up quite early. My mates asked me to join them at the swimming pool. But I just didn't have the mood to get myself wet. I didn't bring my swimming suit and I don't feel comfortable wetting my shirt and pants. So, I just "rendam" my legs in the pool and watch them have the time of their life. The pool is very near the beach and the scenery is great. My mates and I took a stroll along the beach and sitting on chairs that were already there and changing gossips. Later, we took breakfast and shower. But, on my way back to my room, I just remembered that the room key is either with Kak Jun or Kak Normah coz I was the earliest leaving the room. I thought that they gonna be back after waiting for them for about 15 mins. But since they didn't, I had to call the housekeeper to let me into my room. But I din't blame Kak Jun or Kak Normah. After shower and packing my stuffs, I was ready to check out! A bit sad, as I have to leave my KL friends, but I know I'll be seeing them again maybe next month or next 2 months. I will make myself available in KL since I have few projects in hands that will allow me to stay in KL..hehe..